I want to talk about Asian ear wax, but should first say that Evie is doing well! It felt wonderful to have people checking in on us on text and Facebook. The day started at 4:45 am today, so if this post seems delirious, it's because I am delirious. For the benefit of someone who might go through this one day at Boston Childrens, first we went to the Surgical Unit on the 3rd floor of the main building, and checked in. We waited in the pre-surgery waiting room for a bit, where Evie waved at everyone. Then we went into the pre-op area, where she kept smiling and laughing, thinking we were having great fun. We met with each of the 3 surgeons and the anesthesiologist to discuss the procedure and sign consent forms. Erick ended up taking her into the OR (he had to gown up) because she fought the medicine to make her sleepy with every ounce of her toddler-ness (that is a word, once you have a toddler). Evie first had ear tubes put in, which is called a myringotomy. The tiny tubes drain fluid from inside the ear. This only takes 4 minutes, so they didn't let us go downstairs for breakfast until we heard from the ENT surgeon. He came out and told us that some fluid had drained from her ears, but they were pretty clear. She did have a lot of ear wax. Apparently she has Asian ear wax, which I didn't know was a thing. It's not like people go around talking about the texture of their ear wax. According to the ENT (who was Asian himself), Asians have dry and dense ear wax. This has been confirmed by at least two Asian people today--one scientist and one cardiologist (go science!). I am sure we are all better off for knowing this information somehow. The second procedure was the removal of extra tissue that had formed around her g-tube site. The surgeon explained that he did not think it was the right time to remove it, because skin had grown over it. When she weans off the g tube for good, he will surgically close it and remove the tissue then. The third and fourth procedures were with Ophthalmology. Dr. Dagi was awesome. She aimed to reduce the amount that Evie's eyes were both turning in, and the left eye also was pulling up into the corner a bit, so she adjusted the muscle responsible for this as well. It seems likely that she will need at least a second adjustment at some point, but this is common as kids grow. 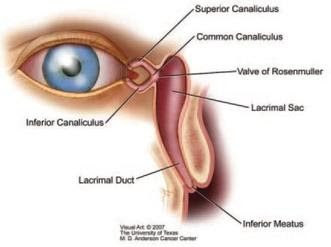 The lacrimal probe of her tear ducts showed everything to be clear, despite some anatomical differences in her tear pathways that cause her eyes to be watery. We are hoping she will grow out of that on her own, but she will have watery eyes for awhile now. Brave little Evie was in surgery from 8:30 am to 12 pm and then went into recovery, where she proceeded to scream her disappointment in all of humankind for making her undergo such torture. It's a tough thing to watch your child look so confused, scared and in pain. We did all the parental things, such as rocking her, singing to her, and telling her her favorite stories, but what made her stop crying and open her eyes was Bob the Train on YouTube, singing Itsy Bitsy Spider. It was like a switch turned off and the crying stopped instantly once she felt my phone in her hands. That's a tip for anyone with a toddler coming out of anesthesia if your kid won't stop screaming! We settled into the PACU for what we thought would be a long day. I think now that they over prepare you. Initially I was told that we should expect to stay the night. Then we were told that it would be a very long day. Then an hour after we saw Evie in recovery, we were told we could probably leave in 20 minutes. We were very pleasantly surprised, and bundled up a very grouchy but lively Evie. 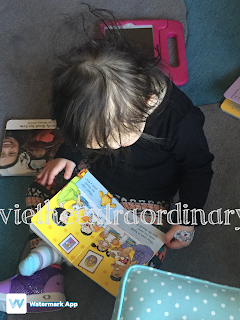 Evie came home and immediately went to her books. She is very cranky, but we are so happy to be home. Home with crazy hair, bloody tears, and bloody nasal drip. Oh, and apparently toddlers at 2 and 3 years of age are likely to be hyperactive after anesthesia wears off. Now comes lots of ear drops and eye drops for a few days and hopefully catching up on sleep for all of us. But we are grateful she came through with flying colors! Thank you so much for your prayers and good wishes! We felt them! Woohoooo!!!!!!! Go, Evie!!!!!!!!!!!!! And thank you, GOD. Oh man. Amen!!!!! So glad that everything went well! Hope she's resting now that you two can rest up as well! Does she have to go in for a post-op checkup soon? Love how you explained everything. Makes it that much more clear to understand and know what's going on! Love you three! Thank you, Grace! Yes, we have post-op scheduled for Monday. Thanks for your prayers! Hope you guys are hanging in there as well!! A huge sigh of relief! Thank you, God! And praise God that yesterday is behind you! Evie's a champ, but you and Erik are super champ parents. Thank you for sharing your journey with us.